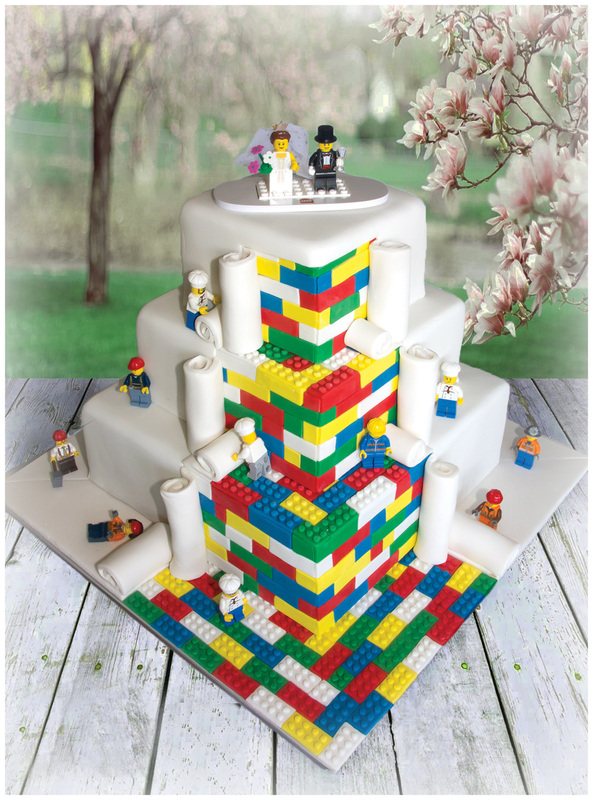 Have you always wanted to know how to make a lego cake? Well I will now reveal all! This 3 tier ( 5″ / 8″ / 11″ ) square cake will serve 100 dessert portions. The top two tiers are Gluten Free Orange and Almond filled and covered with white chocolate ganache and the bottom tier is a Moist Chocolate cake filled and covered with dark chocolate ganache. All three tiers are then covered in fondant. 1. Scrub oranges well and leave them whole. Put them in a large pan with enough water to cover them. Put a small plate on top of the oranges to keep them submerged. Bring to the boil then reduce heat and leave to simmer gently for 1 hour until very soft. 2. Drain oranges well, then put back in the pan and leave until cool enough to handle. Cut in quarters, remove pips, then puree in blender. 3. Use electric mixer to beat eggs, sugar, baking powder and a pinch of salt until pale and creamy. Beat in the almonds and 630g of the orange puree. Leave for 20 mins and preheat oven to 180C. Pour batter into the two pans and check with a skewer that they have the same depth. 4. Bake for 30 mins The cakes will have different baking times as they are different sizes so keep checking every 10 mins or so until golden brown and a skewer comes out clean. Put cocoa and boiling water in a large bowl and mix to a paste. Add remaining ingredients and beat till combined. Do not over beat. Bake for 30 mins. The cake will take a lot longer than 30 mins to bake so keep checking every 10 mins or so until risen and shrinking from side of pan. I decided to make the Lego the same size as actual Lego but this was a big mistake as it took forever to make all the bits and pieces. You could make the Lego 50% bigger and save lots of time and the cake would still look good. I coloured my fondant to match actual Lego bricks. I used a drinking straw attached to a syringe (with strong glue) to make the little studs and I used a square cutter that was approximately the size of two bricks and then simply used a knife to cut them in half. When covering the middle and bottom tiers, I rolled the fondant a little thicker than normal so that the bricks would appear to be ‘under’ the fondant. I cut the fondant half way along the side on all tiers to give a uniform appearance. The top tier does not have any fondant cut away on the top so make sure you don’t get carried away and treat it like the other two tiers. Start with the cake board and place the white fondant first leaving the area to be covered in bricks free. Fill in with the bricks and then the studs making sure that you have covered the area plus extra which will be under the bottom tier an inch for a neat look. When the board and the bottom tier were dry I placed the bottom tier right in the middle of the cake board. The middle and top tiers were not placed in the middle as they were placed a little more to the back corner so that there was lots of room at the front for Lego people and for the rolls of fondant. If using a dowel as I did you will need holes in your set up boards and the top two tiers will need their holes off centre so take some time to get those positions correct right at the start. I also used internal pillars to hold the weight of the tiers. Roll the fondant up like bandages and attach with some icing using a piping bag.